I recently had to assemble a slideshow in iPhoto and found the only way to get a black slide (to separate the last slide from the first in a continuous play slideshow) was to shoot a black image on my camera and upload it to iPhoto. Is there a way to do it within iPhoto itself? And is there any way to add text—say, a title or copyright bug—to a photo or to create a text-only slide in an iPhoto slideshow? In short, is there any way to incorporate text into iPhoto images? Regrettably, while iPhoto ’08 may be a perfectly fine application for keeping track of your images and for light-to-moderate image editing, it’s fairly limited when it comes to slideshows and text overlays. Many people faced with these kinds of demands first turn to iMovie ’08. 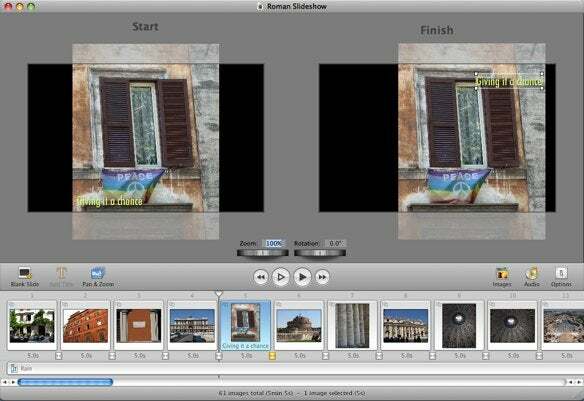 Within iMovie you can string together a series of pictures imported from the Media Browser. To add a title, select one and drag it between two of your images (or place it at the beginning or end). iMovie automatically creates a black frame where you can add text. You can also impose titles over images by dragging the blue title icon where you'd like the icon to appear. Now let’s talk text overlays and watermarks. You can create a slideshow in iDVD and, within its Settings sheet, enable the Show Titles and Comments option. This will impose picture titles and comments over your slideshow images. But it’s a pretty crude tool as you have little control over how that text looks. By default, iDVD allows you to add only an Apple logo as a watermark. My colleague, Rob Griffiths, explains how to replace that watermark with one of your own in this Mac OS X Hints blog entry, but the process may be beyond some people’s capabilities. Another option is to export the slideshow as a QuickTime movie, open the movie in QuickTime Player Pro, and then paste a watermark onto that movie. MacTipper.com provides instructions for doing just that. Or you can turn to a third-party utility for imposing watermarks on your images before they become part of a slideshow. Script Software’s $20 iWatermark and LAJ Design’s $16.50 DropWaterMark can do that. Boinx Software's FotoMagico is a powerful slideshow application. But wait, there’s more. And that more is Boinx Software’s $129 FotoMagico Pro. If you do this kind of thing on a regular basis, it may be worth your while to forget the workarounds and just go with a complete and capable slideshow application, which FotoMagico definitely is. It allows you to easily create blank slides and then impose text on those slides. Without breaking a sweat you can also add a watermark to your slideshow. And you can add custom titles to each slide and those titles can be animated. It also supports music soundtracks. All in all, it’s a lovely piece of work.